HAVE YOU PREPARED FOR THEM? 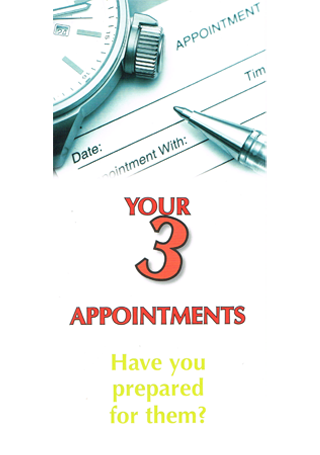 HOW COULD YOU FORGET TO PREPARE FOR YOUR THREE IMPORTANT APPOINTMENTS? ‘And just as each person is destined to die once and after that comes judgment’. ‘The time has come for you to die’. ‘Both go to the same place—they came from dust and they return to dust’. ‘No one can live forever; all will die. No one can escape the power of the grave’. ‘None of us can hold back our spirit from departing. None of us has the power to prevent the day of our death. There is no escaping that obligation, that dark battle. And in the face of death, wickedness will certainly not rescue the wicked’. ‘For soon I must go down that road from which I will never return’. ‘Remember him before you near the grave, your everlasting home, when the mourners will weep at your funeral’.